'Active contours' is an energy-minimizing deformable parametric contour, that is typically used to segment image regions enclosed by edges. 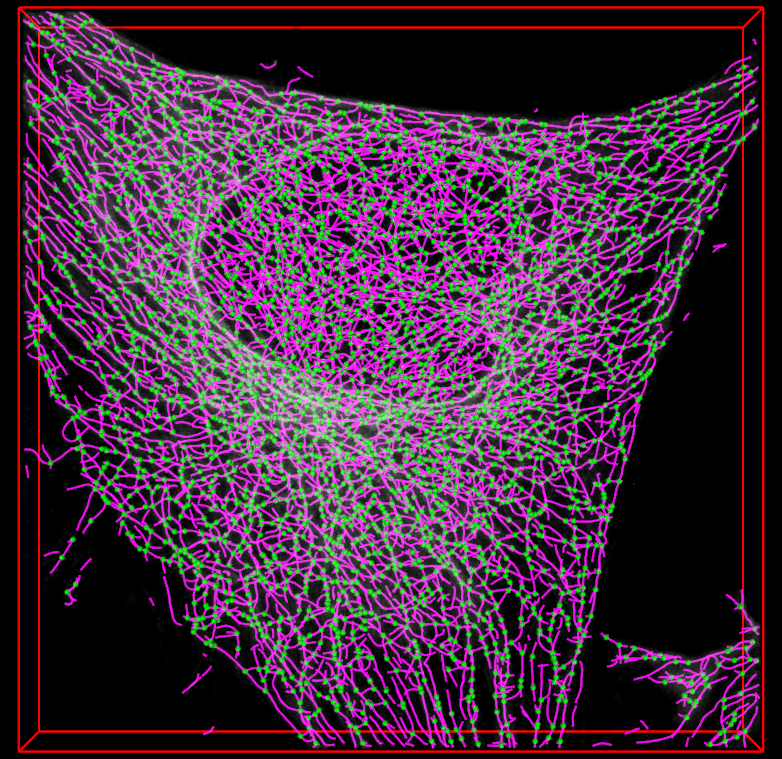 JFilament is an ImageJ plugin for segmentation and tracking of 2D and 3D filaments in fluorescenece microscopy images. The main algorithm used in Jfilament is "Stretching Open Active Contours" (SOAC). In order to use this method, the user must define seed points in the image where the SOAC method will begin. JFilament also includes 2D "closed" active contours which can be used for tasks such as segmentation and tracking of cell boundaries. 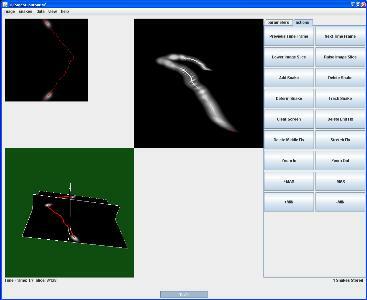 SOAX is an open source software tool to extract the centerlines, junctions and filament lengths of biopolymer networks in 2D and 3D images. It facilitates quantitative, reproducible and objective analysis of the image data. The underlying method of SOAX uses multiple Stretching Open Active Contours (SOACs) that are automatically initialized at image intensity ridges and then stretch along the centerlines of filaments in the network. SOACs can merge, stop at junctions, and reconfigure with others to allow smooth crossing at junctions of filaments. SOAX provides 3D visualization for exploring image data and visually checking results against the image. Quantitative analysis functions based on extracted networks are also implemented in SOAX, including spatial distribution, orientation, and curvature of filamentous structures. SOAX also provides interactive manual editing to further improve the extraction results, which can be saved in a file for archiving or further analysis. 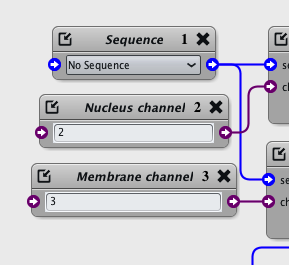 Useful for microtubules or actin filaments. Observation: Depending on the operating system, the installation may or may not require Boost C++, ITK and VTK libraries. Windows has a standalone executable application without the need of those. This Matlab code demonstrates an edge-based active contour model as an application of the Distance Regularized Level Set Evolution (DRLSE) formulation. Tracks a cell in a 2D video using active contours, and produces a list of ROI where intensity is measured and reported into a workbook. The cell must be first delineated with a ROI in the first image of the video. 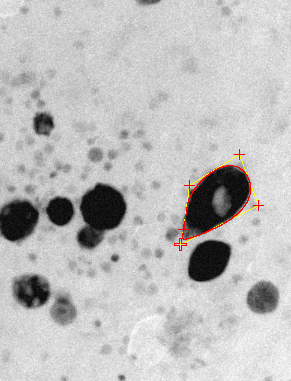 This protocol first extracts the cell nuclei from a given fluorescence channel (full labeling), and grows a contour from each nucleus to extract the cell edge in another fluorescence channel (membrane-labeling). This is an icy package that encapsulates tools to design and implement parametric active contours. The package provides fast 2D and 3D filters for image preprocessing, and a framework to create and evolve snakes defined by a set of control points. This software implements an active contour (a.k.a. snake) segmentation method using exponential splines as basis functions to represent the outline of the shape. While the snake is versatile enough to provide a good approximation of any closed curve in the plane, its most important feature is that it perfectly reproduces circular and elliptical shapes. These features are very appropriate to delineate cross sections of cylindrical-like conduits and to outline blob-like objects.